Why do water levels change? Decisions about how much water will be stored or released from reservoirs take into account many values on both sides of the border, including fisheries, flood control, hydroelectricity, irrigation, recreation and transportation. The volume of water in the Columbia River varies seasonally, depending on the timing and volume of melting snowpack and precipitation. In Canada, the highest flows occur between May and August; the lowest between December and February. In the U.S., peak flows typically occur between April and June; the lowest also occur between December and February. As the need for hydroelectricity increases during the winter months, water stored in reservoirs behind dams is released. This water flows downstream and generates hydroelectricity each time it passes through a generating station at a dam. In winter, reservoirs are drawn down and water is released to meet the need for hydroelectricity. By spring freshet, reservoir levels are much lower and the cycle begins again as melting snowpack refills the reservoirs. Canada and the U.S. manage Columbia River flows by cooperating on decisions to store or release water behind three CRT dams in Canada: Duncan, Hugh Keenleyside and Mica. Operations at a fourth CRT dam (Libby, on the Kootenay River in Montana) are also part of the system. This dam affects the Columbia River as the Kootenay River is a major tributary of the Columbia. Water flows in the Kootenay affect flows in the lower Columbia south of Castlegar, BC. The ability to store water in reservoirs behind dams means water can be released when it’s needed for fisheries, flood control, hydroelectricity, irrigation, recreation and transportation. Releasing water to meet these needs influences water levels throughout the year and explains why water levels change frequently. Where can I get information on water levels? Subscribe to BC Hydro email updates on the Lower Columbia reservoir level forecasts and other information. Subscribe to BC Hydro email updates on the Upper Columbia reservoir level forecasts and other information. How much do water levels change in Columbia Basin reservoirs? A freshet is a sudden rise in a stream or river due to heavy rain or melting ice or snow. What is the Columbia River Treaty? The Columbia River Treaty (CRT) is an international agreement between Canada and the U.S. for the joint development, regulation and management of the Columbia River in order to coordinate flood control and optimize electrical energy production on both sides of the border. The CRT has no official expiry date, but has a minimum length of 60 years, which is met in September 2024. It is possible that one or both countries may wish to renegotiate parts or all of the CRT, or terminate it entirely. What is the lifespan of the Columbia River Treaty dams? Columbia River Treaty dams have a long life of more than 100 years, and are continually maintained and upgraded. In fact, with reinvestment over the long-term, the operating life of a dam could be indefinite. Why is Libby Dam different from other CRT dams? Libby Dam has different operational obligations compared to the three CRT dams in Canada. Although Canadian land was flooded to fill Koocanusa Reservoir, and Libby regulation improves the value of hydro generation at downstream plants on the Kootenay River in Canada, neither BC nor Canada receive direct benefit payments or compensation. Still, under the CRT the two countries jointly agree on reservoir management operations, and therefore, river flows, primarily for flood control and power generation purposes. What are the prospects of adding power generation to Duncan Dam? 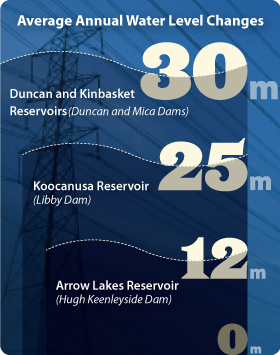 A number of agencies have explored the prospects of adding power generation to Duncan Dam. Columbia Power Corporation, CBT’s joint-venture power partner, is currently investigating the possibility of adding generation to BC Hydro’s Duncan Dam. Considerations include hydroelectricity prices, the cost of adding generating capacity, and technology. No decision has been made at this time. The completion of Grand Coulee Dam in Washington State in 1941 blocked salmon and other fish species from getting to the upper Columbia River. Fish passage exists on dams downstream from Grand Coulee, with the exception of Chief Joseph Dam, which is now the first barrier for fish heading upstream from the Pacific Ocean. Many dams in the U.S. have fish ladders that enable fish to swim upstream, plus screens or bypass systems, so fish swimming downstream avoid turbines. In Canada, newer hydroelectric projects (Arrow Lakes Generating Station and Waneta Expansion Project) have been designed to accommodate upstream fish passage in the future. How does a dam generate power?